Tiger Woods almost hit a hole-in-one on the par-3 No. 16 during his final round at the Masters on Sunday. 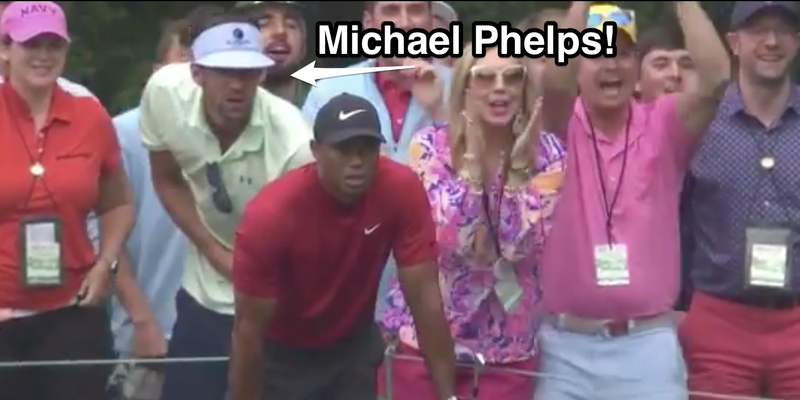 Replays of Woods watching the shot showed that Michael Phelps was cheering Woods on just behind him. Woods has been playing some of the best golf of his comeback at the Masters all weekend and would go on to birdie the hole. Tiger Woods was on a tear through the final round of the Masters on Sunday, and at the par-3 No. 16, Olympic champion Michael Phelps had a front-row seat. Woods was shooting with a 1-stroke lead from the tee box at the par-3 No. 16, and hit an absolutely brilliant shot that landed on the green and started spinning towards the pin. While the ace would miss by inches, the shot was enough to send the crowd at Augusta National into hysterics. The Masters broadcast later showed a replay of Woods cheering the ball on, saying to himself “Come on! Come on!” as he peered towards the green. Cheering right behind him was none other than 28-time Olympic medalist Michael Phelps. Woods performance on the second nine at Augusta National in the final round has provided some of the best golf of his comeback — it’s no surprise a fellow champion would be excited to cheer him on.